Running a car wash service, or any type of business in general, can get pretty demanding over time. With numerous competitors lying around every corner, a good promotional and marketing method is extremely important for your business to thrive. 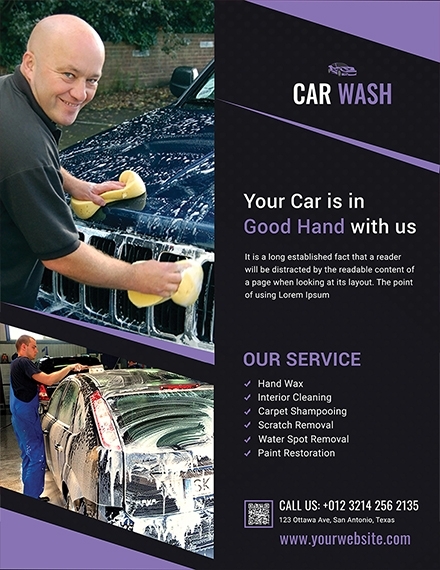 One of the most cost-effective ways to promote your products or services is through a pleasing car service flyer. This allows you to showcase your offers to a targeted market through a visually attractive and informative text and graphic layout. 1. Goal or Purpose: Before jumping right into your flyer design, you need to determine the goal or purpose you want to achieve. This will serve as a basis for your overall content and layout, allowing you to specify the information to include along with the image you want to portray. 2. Compelling Headline: More often than not, your headline will be the first thing prospects read as soon as they lay their eyes on your flyer. Headlines are usually kept short and simple, yet clever enough to entice readers to check out your business. While you can always use your company tagline for the headline, it’s best to write something more appealing by using keywords like Free, Limited Offer Only, and Buy One Get One, among others. 3. Persuading Message: This is the call to action of your flyer. This serves as an opportunity for you to subtly yet directly get your message across to prospects in favor of your goal. Whoever gets a hold of your flyer should know exactly what to do as soon as they finish reading the last word. 4. Popping Graphics: This includes the colors and images added to the flyer. These graphic elements can greatly influence the message you are conveying and elicit a desired emotion from readers. Because of this, it’s important to choose graphics that accurately represent your business. This means images that viewers can relate to and colors that reflect your brand. 5. Contact Information: There’s no point of creating a flyer if you fail to give people a direct means of contact. Potential customers might have questions or inquiries that need to be addressed before they can push through with their purchase. Thus, remember to include your phone number, email address, website URL, and social media profiles for reference. 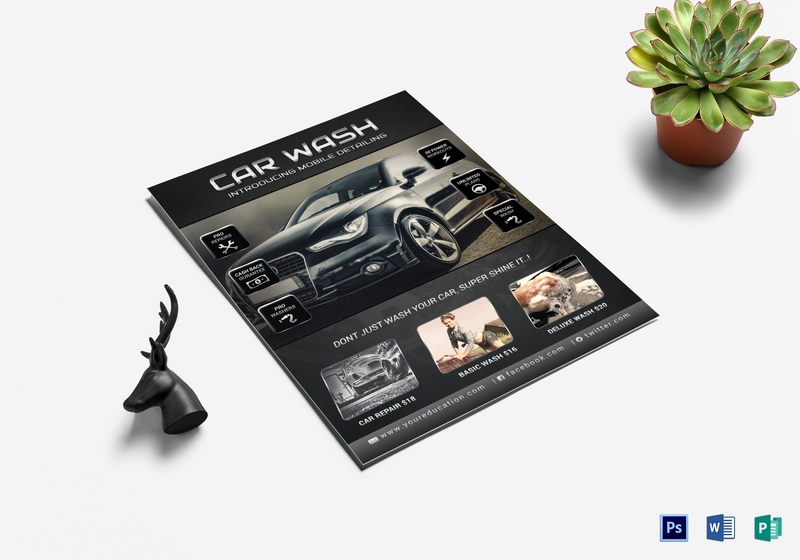 Creating a flyer doesn’t have to be a difficult task to conquer. It’s pretty easy, especially with the right mind-set and technique in hand. So to help you get through this process, refer to the five-step guide presented below. 1. Determine what you want to accomplish with the flyer: A flyer can be used for a variety of things. 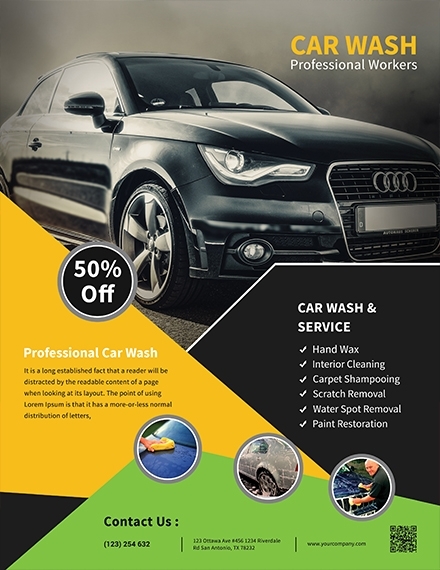 Perhaps you want to advertise a new car wash service that your business just launched, or maybe you have an exclusive deal for recurring customers which can be availed for a limited time only. Whatever it is, it should be defined clearly enough for you to move forward to the next step of the process without questions. 2. 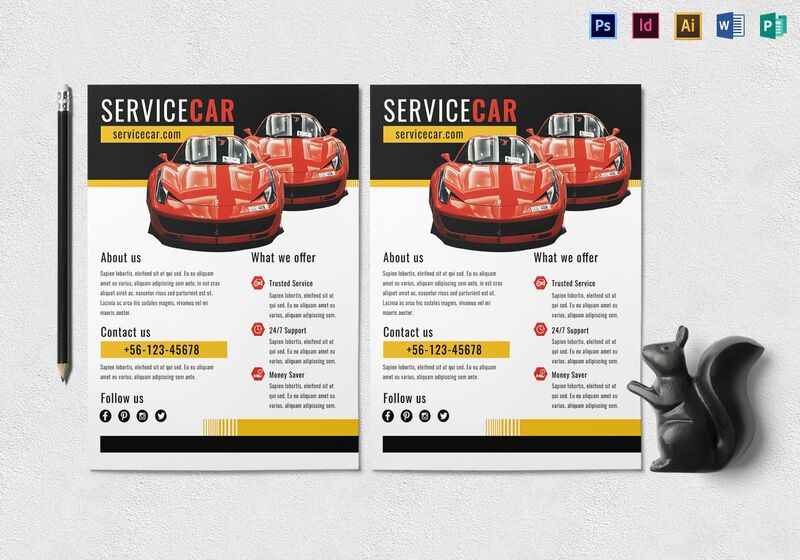 Conceptualize your layout: Once you have figured out what you want to achieve with the flyer, it’s time to conceptualize on a design that will best present your business and brand message to prospects. These elements should showcase your business in a good light; thus, using a readable font, a captivating color selection, and a high-quality image or illustration is crucial to the success of your flyer. You can download stock images or use your own roll of professionally taken shots to fill the layout. 3. 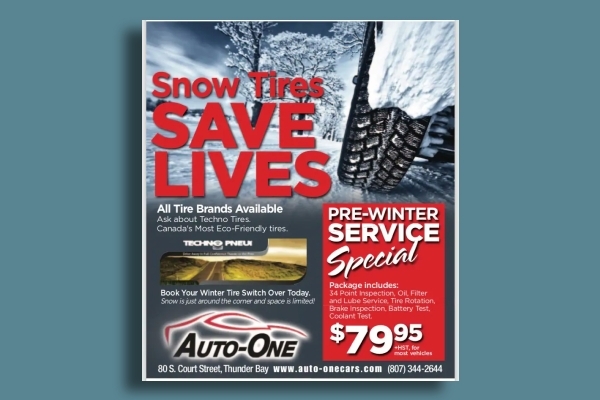 Organize key information: Informing readers about your business offers is one of the primary goals of a flyer. However, this will be impossible to do with a cluttered layout. To avoid such circumstance, aim for a clean-cut design by organizing information in a proper sequence. This should answer the five Ws and one H that prospects are likely to have. Keep in mind that it’s easy to catch one’s attention, but without a good takeaway, your marketing efforts will be put to waste. 4. Layout the overall design: Never settle for an okay piece of work. You need to keep your standards high, as your flyer, or any marketing product for that matter, is a reflection of what your company is capable of. High-resolution and carefully selected graphics is a huge factor to consider when finalizing your layout. 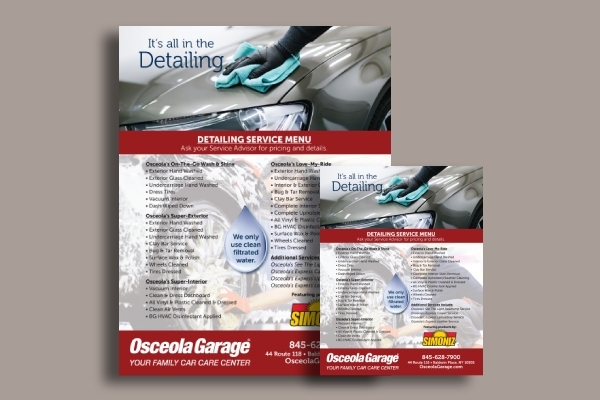 Text must be kept short and relevant, and colors should complement and not overwhelm the overall look of your flyer. 5. Conduct a review for printing: There’s nothing more unfortunate than discovering a little mistake in the final product of your freshly printed flyer. Thus, never take proofreading and quality assurance efforts for granted. Always take the time to review the document for any spelling or grammar mistakes that might hurt the outcome of your flyer. The flyer design must also meet printing requirements, such as page bleed and CMYK color model, to avoid production flaws later on. Select colors that will immediately draw attention: Some colors have a bigger impact than most. While pastel colors may seem perfect for aesthetic reasons, bold colors leave a greater impression due to their demanding nature which causes a person to glance at the item in view. Nothing too dramatic, but just enough to make a random passerby look. 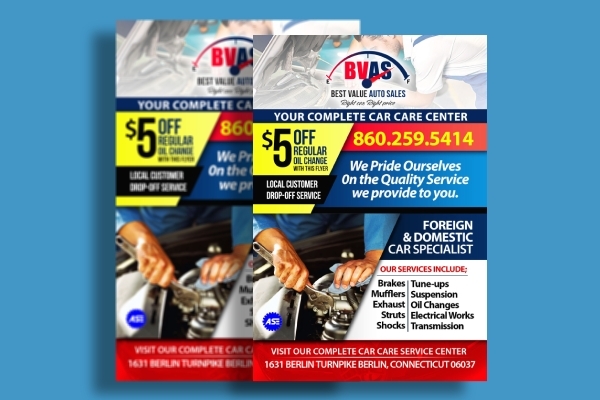 Consider two-sided printing: The thing about car service flyers is that they usually carry a good chunk of information to keep readers fully knowledgeable of what the business has in store for them. 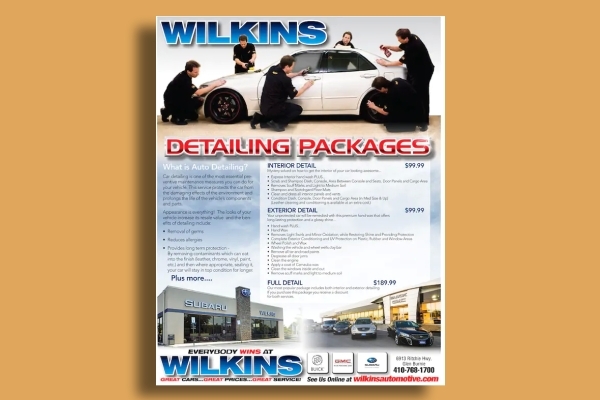 Another reason to start using the back page of your flyer is to simply get the most out of a single sheet of paper. Choose the right font style and size: Remember when everyone played around with the WordArt feature to make PowerPoint presentations? Well, we don’t do that anymore and any attempt to do so should be forbidden. Not only will your font choices affect the readability of your text, but it can also shape one’s perception toward your flyer. It’s best to keep it simple with a maximum of two fonts and nothing below a 10pt size. Avoid using complicated and technical words: Aside from making your flyer readable, it should be easy to understand as well. Stick to simple language and try not to use anything too complicated or industry-specific. It’s also best to focus on the basics to deliver your message loud and clear. 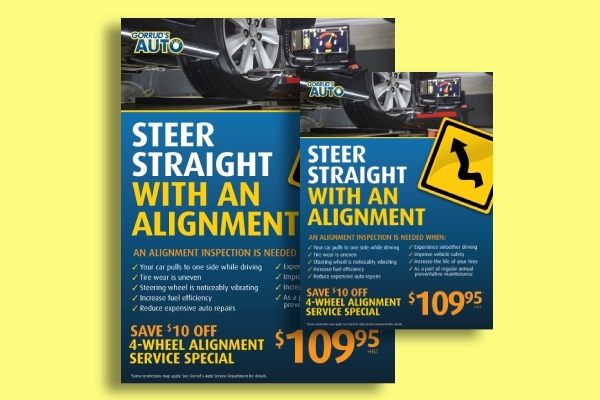 Keep your audience in mind: At the end of the day, your flyer should be centered toward your targeted audience. It should tell readers how they may benefit from your product or service offers, why they should trust your brand, along with what they can do to get their hands on the deals and promos being advertised. Choosing the right flyer size is a vital step of the process, as whatever you decide to use will affect other design elements as well. Thus, it’s important to choose the size of your flyer carefully. 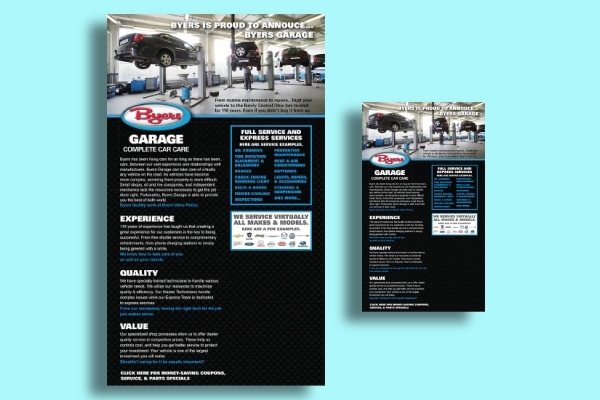 Below are the common flyer sizes you can use to promote your car service business. 5.5″ × 8.5″: Also known as the “half sheet” paper size, it’s cheap printing rate and small dimensions make it a popular choice among many small businesses. Not only can you distribute twice as much flyers to prospects, but recipients can also hold onto the flyer for later use by putting it inside their purse or up their refrigerator door. 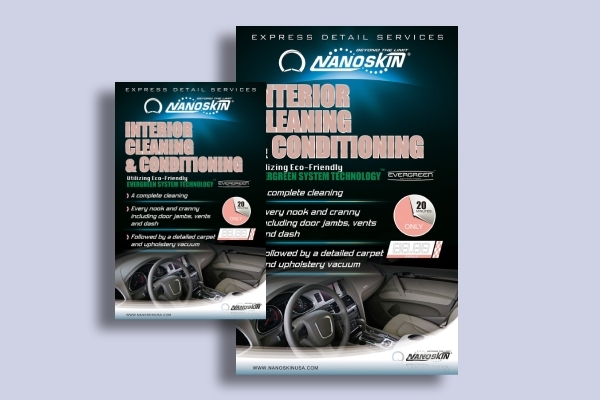 8.5″ × 11″: As the standard paper size used in homes and offices, this is a highly effective and budget-friendly choice for car service companies that wish to relay business information to prospects in the easiest manner. It can hold a sufficient amount of information at a time, without being too bulky to carry around. 11″ × 17″: Similar to a company brochure, this flyer size is often folded in half or so to deliver a greater amount of information to readers. This is commonly used to print takeout menus, newspaper inserts, direct mails ads, and other similar mediums. 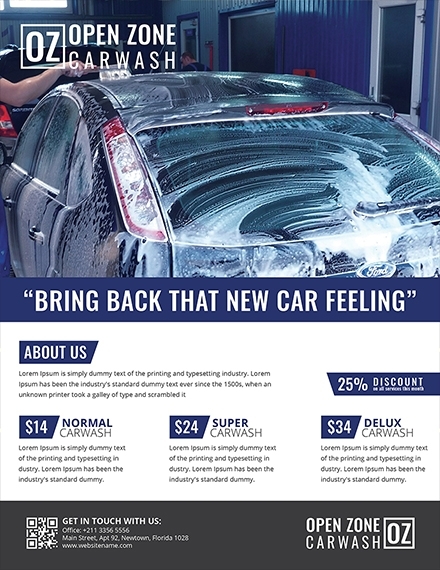 How can I make a car service flyer? Though you could always craft your flyer from scratch using an editing program like Illustrator or Photoshop, you can also opt for a much easier approach with the help of a ready-made template. 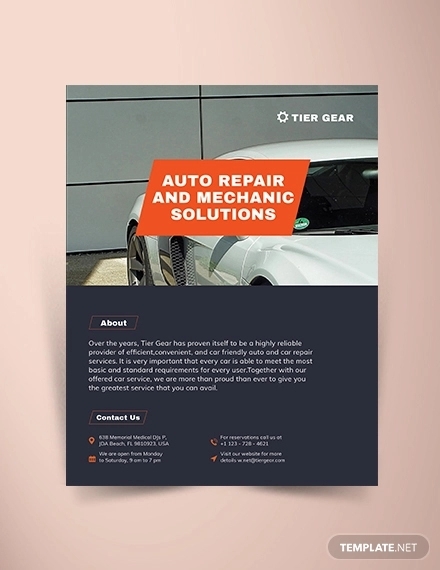 Templates are typically designed to meet industry and production requirements accordingly, so you won’t have to worry about adjusting the quality and dimensions of the flyer before printing. Be sure to personalize the design to keep it unique as well. 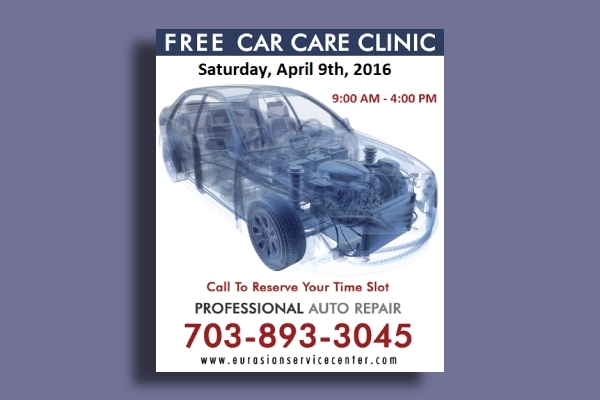 What should a car service flyer include? 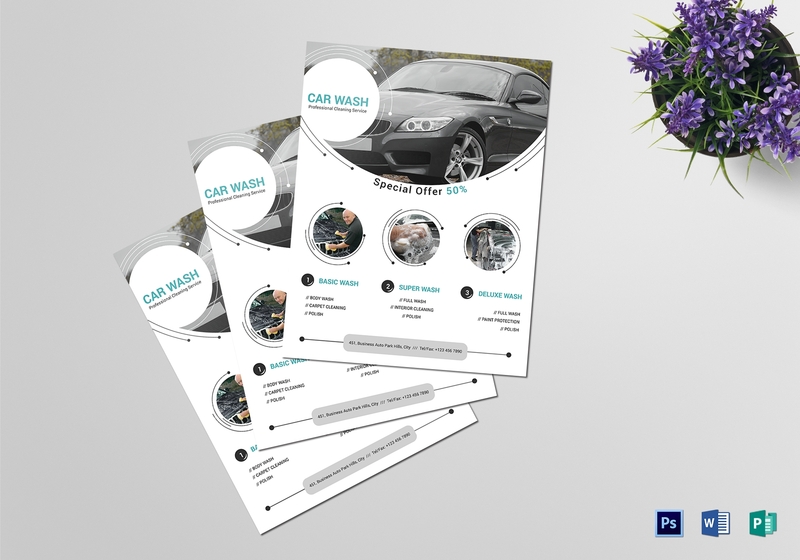 A car service flyer must contain basic information about the business such as special offers, prices, office address, and contact details. People should know exactly what the flyer is for at a single glance. Incorporating your brand identity through a proper color selection and a logo design must also be practiced to keep your business on top of a reader’s mind even when the flyer is no longer in sight. 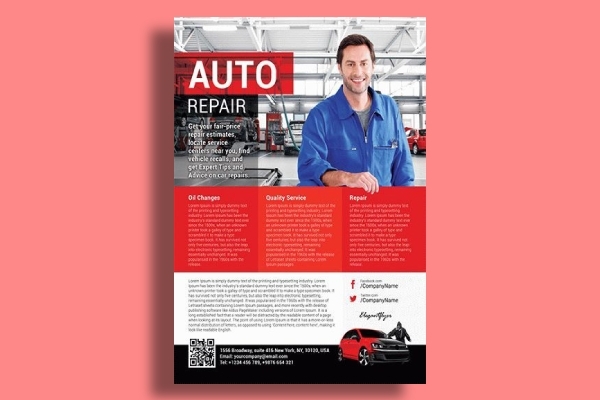 Why is a car service flyer important? Due to the extreme conditions that cars and other vehicles go through on a daily basis, having them checked and fixed regularly is extremely important. 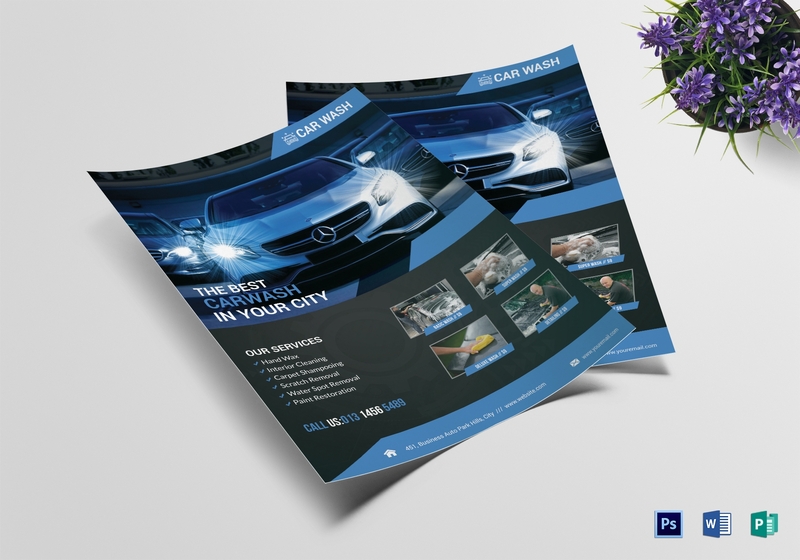 But because people only recognize businesses that have already established a name for themselves in the industry, small car service businesses must step up their game with the help of an advertising flyer. 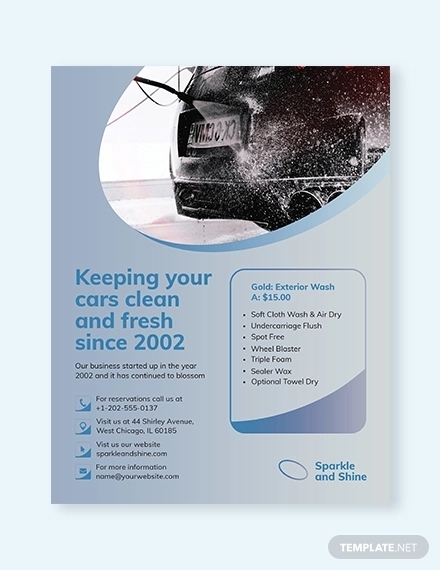 Investing in a flyer is a great way to communicate your business offers to prospects in a quick and inexpensive method. And there you have it! 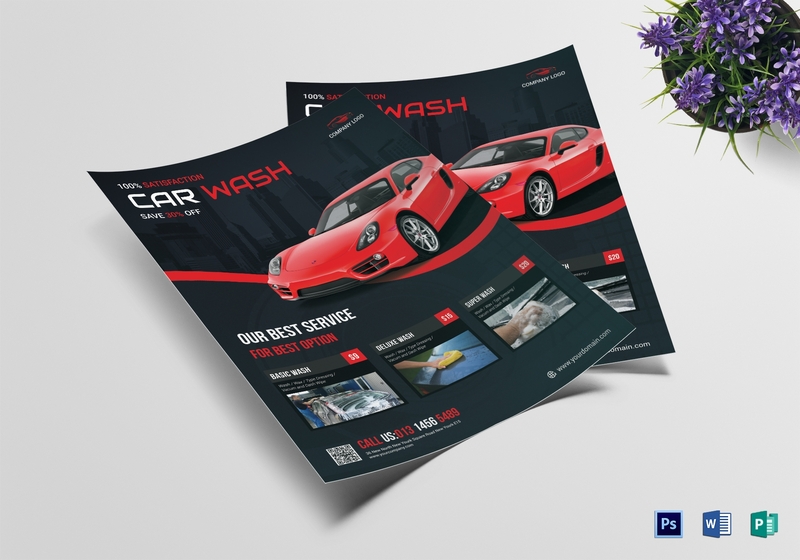 Promote your car service business today with the help of our stunning collection of flyer design ideas and templates.